Today is World Book Day; children and adults are like are dressing up as their favourite book characters, celebrating their favourite stories and digging out their best books to read again. And we all know that art and books go together beautifully - a piece of art preserves its own story, meaning and piece of history, just as the published book does. 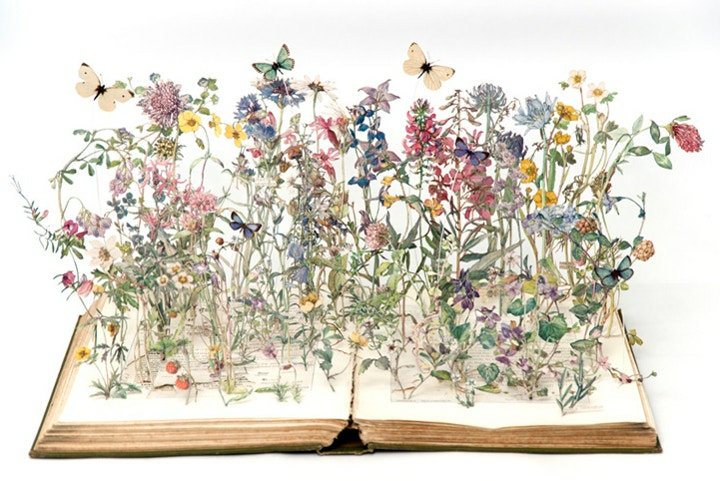 Some artists take the marriage of art and books even further. 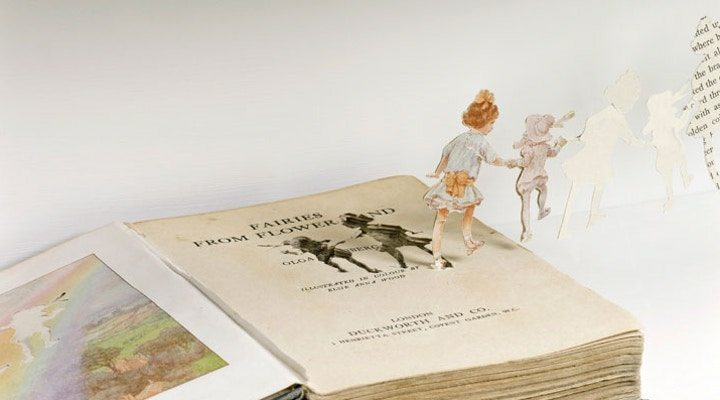 Su Blackwell, an RCA graduate and artist who works primarily in paper, makes book sculptures and installations out of second-hand books. She has been commissioned to make work for several publishers and magazines, and well-known brands like Crabtree & Evelyn and Volvo. But it's World Book Day, and we wanted to talk to her about her page-turning, story-telling inspiration that comes from the beautiful book itself. Happy World Book Day Su! Before we talk art – do you have a favourite book of all time? It's hard to choose one above all others, but I could pick out some of my favourites...Alice in Wonderland, Wuthering Heights, The Snow Queen by Hans Christian Andersen, Bram Stoker's Dracula, and most recently The Crane Wife by Patrick Ness. I like the fantasy elements in these stories. Can you tell me how you got into making Book Sculptures? I studied mixed media textiles and sculpture at the Royal College of Art, and during a trip to South East Asia I was introduced to paper folk art for spiritual ceremonies. On returning to my studies, I began experimenting with paper, and this led me to cutting things out of books. It has been a progression since then, as I began sourcing books as materials to work with. What is it that draws you to the object of the book? I love the physicality of a second-hand hard-back book, and the history that goes with it. You also work in set design, installation and commercial projects, like making work for the front of book covers. What’s been your most memorable project in recent years? I get the most satisfaction when making the art that is personal to me. One of my most memorable commissions was an installation at the Brontë Parsonage Museum in Haworth. Having studied for my art degree in Bradford, I was familiar with Haworth and the Parsonage, and one of my favourite books is by Emily Brontë, so it was a dream come true to be asked to create an exhibition based on the museum archives. The staff at the museum were great, in that they accommodated me with everything I proposed to do. I worked on site at the parsonage for a week, sometimes working there until midnight. I thought it might have been spooky, because it is rumoured to be haunted, but I have to say, I found it a most warm and welcoming place. Can you describe your art materials toolkit to us? It's very simple: a cutting mat, metal ruler, Swann-Morton scalpel and plenty of extra blades. Do the actual books you use inform the narratives you create? For example, did you use a copy of Treasure Island to create your Treasure Island book sculpture? Yes, the book always informs the sculpture. 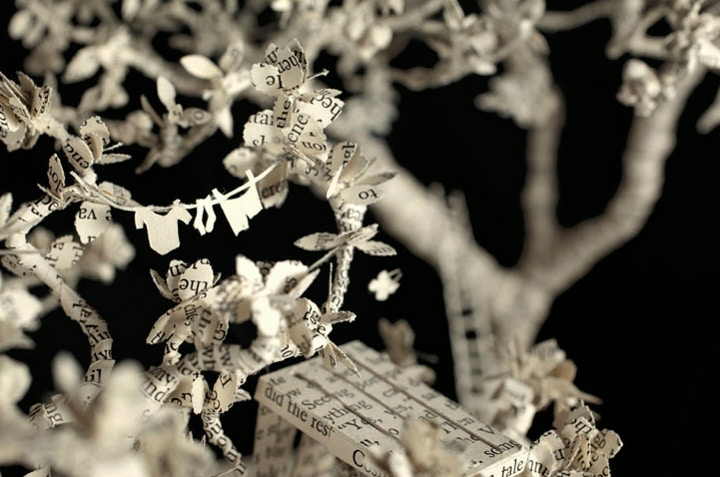 The sculpture is connected to, and made from the pages of the book. I carefully select the words I'm cutting out, so that you can read an added layer of meaning when viewing the sculpture. 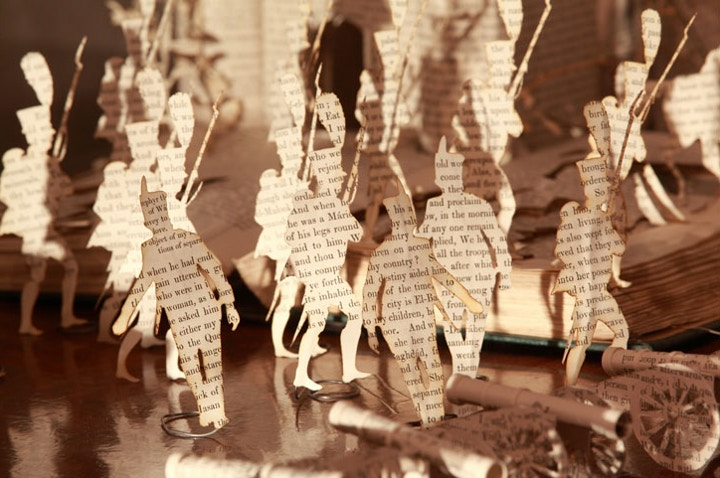 Do you think lighting your book sculptures gives them another dimension? Yes, I first began using the lights to highlight areas I wanted to draw attention to, or to make elements appear and then disappear. The lights are integral to the sculpture. What are you working on at the moment - any upcoming projects we should keep an eye out for? I have a solo show titled 'Dwelling' at Pola Museum Annex in Tokyo this Spring, and am currently working on a commercial campaign for BA. I also have an illustrated book project by an exciting new writer in the pipeline. You can visit my blog for all the updates! Finally, if you could share a studio with any literary character, who would it be? I think it would be Tinkerbell from Peter Pan, so that she could dust me with fairy magic, and I would be able to create my work in the flash of a pan (as it is a laboriously slow process). But she would probably cause mischief too, so I'm not sure that it would be a good idea to have her here! Shop our range of Books and fill your own World Book Day - or entire year - with the joy of reading. You can shop our Kids Books here. Visit Su Blackwell's blog to find out more about her work and read any updates. 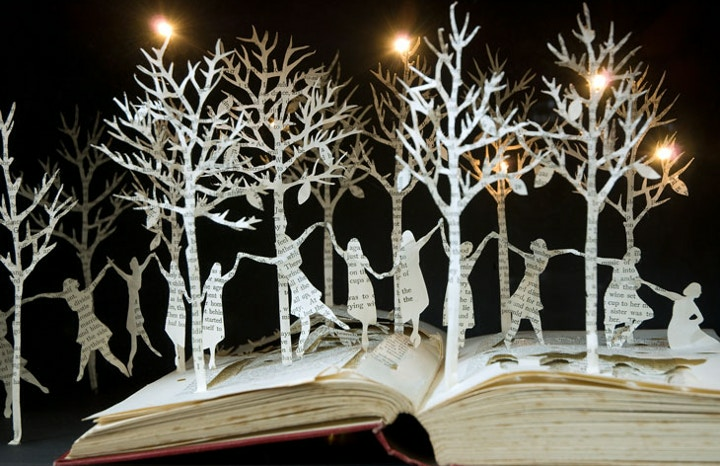 Explore our extensive range of Paper to start your own paper cutting or book sculpture.